In an absolute monarchy much hangs on the personality of the man on top, and the events covered in this podcast are pretty much the result of the emperor’s management style. Constantius seems to have been the kind of boss that corridor warriors thrive under. He was far from ineffective as an emperor and I’ll be looking at his balance sheet a bit later, but he does seem to have had a bit of a weakness in delegation skills. Time and again we see him letting highly unsuitable people get into positions where they follow their own agendas rather than the empire’s best interests. The way things played out with Julian illustrates this. The two men could well have formed a great team that could have done great things. But somehow the intrigues in the court of Constantius always stopped this happening. Julian based in Paris as a junior emperor in the western half of the empire worked very well. Julian was genuinely loyal. He was, as we shall see, extremely reluctant to go against the wishes of Constantius. A stickler for protocol he kept Constantius well informed via regular letters. When he had a problem, like his disputes over taxation with the minister imposed on him, he raised it directly rather than plotting. And when he was beating off the enemies of the empire he was diligent about sending captives back to Constantinople as a tribute and to make it clear it was an imperial victory. It looked like a great arrangement. But Julian was not popular with the circle surrounding Constantius from the start. His simplicity was considered to be a pose – as it probably was. His learning was old fashioned and he was not interested in the latest theological controversies. Basically he just wasn’t one of them and if he were ever to get the top job it was pretty obvious that a lot of them would be out of a job. Early on he was the subject of mockery and ridicule. He was a short and rather hairy individual who it was easy to portray as an ape. His plainly written reports of his activities were made a figure of fun for their dated style and for the uninspiring content. It seems a bit unlikely that Constantius himself was conniving with the enemies of his own empire, but looking at the events of Julian’s early reign in Gaul it looks very much like someone or some people in Constantinople were actively ensuring a tough time for Julian and even going to the lengths of sabotaging military operations to make him look bad. It is not easy to shine when reporting on a gloomy situation with little good news. But as his success grew it became harder to mock. As he changed from a young inexperienced figurehead into a youthful hero he ceased to be a figure of fun and started to become a threat. The contrast between the resounding defeats inflicted on the barbarians by Julian and the indifferent progress of Constantius against the Persians must have been galling, but was a superb opportunity for the gossips and the makers of mischief. A figure of fun is a lot less frightening than a darling of the people with the support of adoring troops. The enemies of Julian started playing up the growing popularity of Julian so as to play on the fears of Constantius. They seem to have succeeded in planting the idea that it was time to get rid of a dangerous threat. And once the emperor was won over they must have been confident that their objective could soon be achieved. Julian’s brother had been eased out his throne without too much difficulty, so the same tactics could be deployed again. The plan went into operation. First Julian’s name was deleted from the notices from the emperor to the provinces, in effect claiming for Constantius the credit for the victories of Julian. Then key personnel were moved. Finally the order came. Two delegates arrived from Constantius with instructions for the troops most loyal to Julian in person to be redeployed to the Persian frontier. Julian must have recognised the pattern. But unlike his brother he was actively involved in the government of his region, so he could also see the consequences of the political games being played thousands of miles away. Gaul had not long ago been overrun by the barbarians and had been close to sliding into anarchy. Julian had saved the situation, but only by the most energetic activity. One of the ways he had turned round the seemingly hopeless situation was the raising of levies from the population of the province. These troops had been motivated by a desire to protect their families, friends and property. They hadn’t signed up to serve far away against distant enemies of the empire. Their own very real enemies were just over the border. The new deployment would deprive Julian of the bulk of his forces, leaving him defenceless if Constantius then chose to redeploy Julian himself, or even to redeploy his head from his body as he had done his brother. But it also left the provinces vulnerable to the barbarians over the border. The situation was obvious to everyone not just to Julian. If the army was withdrawn from Gaul, Gaul would once again be attacked. As they marched away the troops would know that they were leaving behind unprotected friends, family and property. The history of the empire is full of plots, revolts and rebellions. What makes this one particularly interesting is that we have several detailed accounts, so we can piece together exactly how it happened and get an idea of the motivations of the people involved. One of the accounts is that of Julian himself. The order to send the troops east threw him into despondency. He foresaw all the potential problems. It wasn’t just the high probability that the provinces he was in charge of would be invaded. It was also quite likely there would be trouble from the troops themselves. And he would be going back on his previous word that the men he had recruited would not be required to serve beyond the Alps. He argued his case with the envoys. He tried to get Florentius, his chief minister, back to help him make his points and give him some back up. Florentius, who had been appointed by the central government, was almost certainly in on the plot. That he had managed to be both out of town when the delegates arrived, and eluded all attempts to get in touch shouts out that scheming was afoot. Julian was in a bind, with no good options. He threatened the unprecedented action of resigning his post. But ultimately his philosophy won out. The first duty of a subject is obedience. Ultimately, to someone of Julian’s high ideals, it was the supreme sovereign who was responsible for the overall wellbeing of the empire and was entitled to take whatever actions he saw fit. So Julian regretfully complied with the orders making as much effort as he was able to mitigate the inevitable suffering they would cause. Word was out, and as preparations for the long march to the east proceeded, the women of the troops made it clear that they dreaded being left behind. Julian laid on wagons so they could leave with their men. The army was ordered to assemble at various points, including a large muster in Paris itself. Julian advised against this. He anticipated trouble. But he was no longer in charge of the situation. When the forces had gathered in the provincial capital, they assembled for a last speech from Julian before their departure. He praised their valour, picking out particular individuals who had distinguished themselves in the campaigns he had led them in. He expected great things from them in the service of a great prince and urged them to obey their orders dutifully and cheerfully. The oration was met with silence. As Julian had predicted, overnight there were disorders. The men started drinking. With the alcohol weakening their discipline, and their numbers encouraging their boldness the idea of getting Julian to lead them in rebellion took hold and spread. A group hammered on his door to involve him in the plot, but Julian bolted it against them. There was no way of knowing what their mood would be by the next morning. We can only imagine what the men were thinking as they waited for the dawn to break. The most active ones had already done enough to lose their lives. They must have been extremely interested in what Julian himself was thinking. But what they could only speculate about, we know. He was consulting Jupiter. And the chief of the gods was, as were the men outside, urging him to overcome his timidity. As dawn broke on the fateful day, he was now convinced that he had been chosen by Heaven to restore the worship of the ancient gods. It was fortunate that he had made up his mind. With the light breaking, the troops forced their way into his palace and led him through the streets with swords drawn. Julian was, as he was to prove time and again, no coward. Even though he had now resolved to accept, he made the men wait three hours before confirming it. It was important to him not to appear a rebel and that it was clear that he was overpowered by the crowd rather than leading it. Then after this dutiful delay he accepted the diadem – some regimental colours that were to hand that could be used to symbolise one – and was carried through the crowd of soldiers on shields. This traditional form of election with its echos of republican simplicity must have appealed to Julian. It was over 50 years since Constantine himself had been proclaimed in somewhat similar circumstances, so this must have felt to everyone concerned like a big event. He had gained his new rank without bloodshed and in a way that left him blameless – at least in his own eyes. But how would it be viewed by the official Augustus? There was no getting round that the events were not going to be easily accepted and a violent reaction was likely. But maybe trouble was not inevitable. A civil war was not to be entered into lightly, and maybe could be avoided. We don’t have to doubt that someone like Julian would genuinely hate to spill a fellow Roman’s blood. There was also the inconvenient fact that Constantius had considerably greater forces and the resources of a much bigger economy to draw on. Not only would a civil war be a calamity for the empire, Julian would in all probability lose it. So from everyway you might look at it, an agreement with Constantius was far and away the best solution if it could be achieved. He sent an offer of friendship and basically asked for no more than a recognition of the situation as it already existed. There was a telling line where Julian refers to the fact that some courtiers benefit from the discord of princes. He was clearly well aware that his biggest problem was getting round the people that surrounded the emperor rather than the man himself. But Julian was in Paris at one end of the huge empire and Constantius was at that time in Antioch at the other. Negotiations had to be carried by envoys who had 2500 miles to travel. With so much time involved in communication there was ample scope for both intentional and unintentional mischief. In fact the anti-Julian faction had already got at Constantius before his men arrived with their side of the story. This was made easier by the deaths of both the wives of the emperors. Helena, the sister of Constantius had died during childbirth as had the child leaving Julian both wifeless and childless. Eusebia, the wife of Constantius and a long time supporter of Julian had also died. Either might have successfully interceded on his behalf, but it was not to be. While hoping for peace, Julian prepared for war, and his preparations were both meticulous and skillful. As little as possible was left to chance. The supporters of Magnentius were still numerous and making a living by banditry. Left undisturbed they posed a threat. Offered a pardon and employment, they became an opportunity. Julian eased his security problems and hired some reliably anti-Constantius forces. The Germans were the other serious threat to Gaul, and were not so easily dealt with. But Julian did what he could. For instance, he kidnapped the most important German tribal leader and bundled him off to Spain. As modern counter insurgency experts will tell you, disrupting the leadership structure is generally only a temporary setback but that was all Julian needed at this stage in the crisis. His preparations paid off. The reply from Constantius, as delivered by the men sent to deliver it, was cold and haughty. Julian contrived that their message should be delivered in front of a large crowd of his supporters. Julian must have wanted peace and was prepared to make a lot of concessions to get it. He had offered acknowledgement of the superiority of Constantius, gifts of horses and recruits and accepting the appointment of a praetorian prefect directly from Constantinople. But he would not give up his newly found rank. 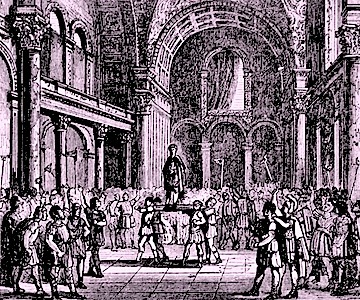 Playing to the gallery, he informed the envoys that he would only withdraw from his Augustus role with the consent of the men who had given it to him. The roar from the crowd made it clear that this consent was not forthcoming. studied to forget.” His mood infected the crowd. The envoys had to be protected from their anger by the drawn swords of the troops. They then had to face the 2,500 mile journey to the other side of the empire to report the failure of their mission. And they took with them a letter from Julian where he poured out all the bottled up resentment from 10 years of having to keep his opinions to himself. Julian must have realised that there was now no choice but to fight and that there was now no going back. He must conquer or he must die. And the odds against him succeeding were high. But he was prepared to be bold, and he was prepared to take chances. And he did so immediately. Only five or six weeks before Julian had been attending a service of Epiphany in Paris. Epiphany still figures on our calendars every January. The Christianity of Julian’s time was very much the same as the one we know now. The institutions that Julian knew and grew up with are still intact and still form a part of the patchwork that makes up our lives. But that Christianity was about to face the biggest challenge it would ever receive in its entire history. In addition to rejecting the authority of Constantius, Julian rejected his religion as well. He openly placed himself under the protection of the immortal gods. This twist would have come as a shock to everyone. Although no direct action had yet been taken against the pagan majority, they must have felt distinctly second class citizens. Their temples were being seized by Christians with official approval. Their priests were no longer maintained at civil expense and rites were no longer practiced in official occasions. To have someone of the rank of Julian turn back to the old ways would have been a profound shock. So momentous an event couldn’t have passed without a ceremony. Julian was later to get a reputation for his love of sacrifices – his enthusiasm was enough for people to joke that he might actually make horned animals extinct. I don’t doubt a sacrifice was given for such a momentous event. Probably at least one bull lost his life. Days are short in February so the light was probably fading as the smoke of the sacred incense rose into the sky as the animal was consumed. Julian had been in turn a helpless orphan, a political prisoner, a devoted scholar, and an imperial puppet. By his own efforts and talent he had transformed himself into a formidable military figure and a popular hero. Circumstances and the machinations of his enemies had forced him to become a rebel. He now chose of his own free will to become how he is still remembered. He rejected the religion forced on him from birth. He returned to the ancient Gods of his ancestors and his country. He was now Julian the Apostate.